Barrington Mulch & Flower has over 20 years experience, is fully insured, and provides free estimates. We use aggregates such as: 3/4" Crushed Gravel, Various Sands, Crushed Stone and Stone-Dusts. Along with choosing the right products for your surface needs, we use a road grader. 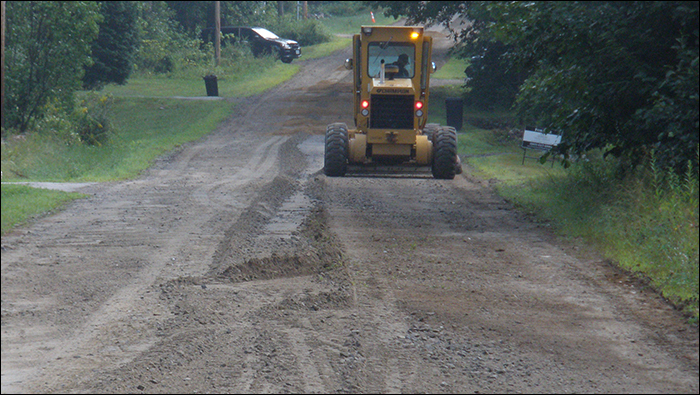 The road grader is our best tool for maintaining unpaved roadways and driveways. The road grader is distinctive with its ability to reposition its blades for a multitude of operations. With the use of proper aggregates and our grader, we can reshape your surface with the proper crown for a well-drained roadway or driveway. For your product needs Barrington Mulch & Flower offers delivery service with our 1-1/2 ton dump truck as well as our 14 yard dump truck. We can also load your pickup truck at your discretion at our yard, however we assume no liability.